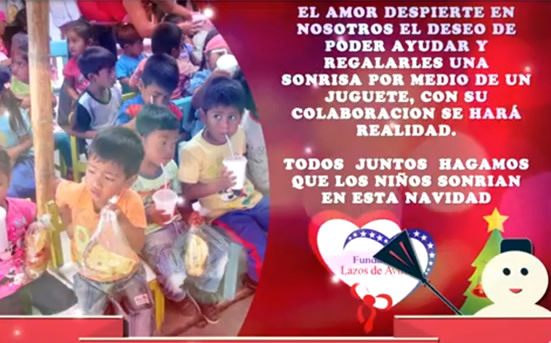 Lazos De Ayuda Foundation carried out the Christmas campaign for four consecutive days, providing joy and love, leaving smiles in each of the children and leaving the message of GOD. 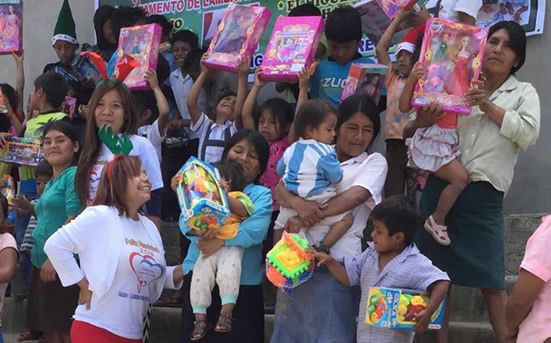 More than 500 children benefited, in the hamlets further away from the District of Salas and Incahuasi. Thanks to Dr. Elma Mera, to Mrs. Dolly 'Paquita, and to all the people who in one way or another contributed their bit to this work of love that made these innocent children happy. On Saturday, December 10, 2016, two Christmas shows began with the assistance of the volunteers, in Shita Alta Department of Lambayeque, Peru and neighboring villages. We also had the collaboration of the mothers of the families of the hamlets, to help us in the preparation of the chocolate which the children loved. “We are a non-profit organization ww.fundacionlazosdeayuda.org Our main objective is to spread Solidarity, Charity and Commitment for the sake of others; where we have the moral responsibility to provide our support and assistance for the development of others. We need your help to provide a beautiful Christmas to many needy children in northern Peru and through LOVE awakens in us the desire to help and give a smile to children with a toy, with your help it could be done. Together we can have children smile this Christmas. With your help we can touch the hearts of many children. No matter the amount you can contribute, what is important is the intention and we are very thankful. God bless you and Merry Christmas. That recent visit was earlier; and it has not been the only one, since Mrs. Maritza Castro performs around four annually with her work team in Lazos de Ayuda. 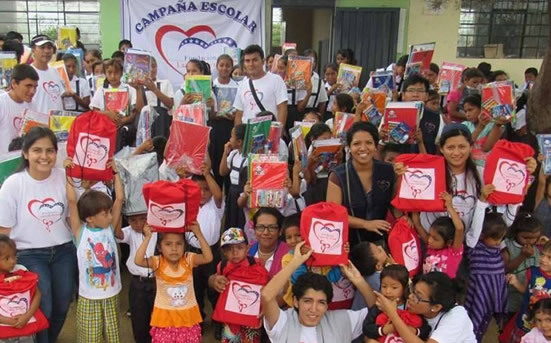 Since 2008, the organization has provided help to the neediest children in Peru. It all started with an urgent need to help. Out of love; "For reasons of life, I was always letting go of everything and thinking of others," Castro said. That generous attitude among his people gradually spread to a greater dream. "I was 27 years old when I arrived at Georgia. Like everyone, my beginnings here were hard. I formed my company and there were wonderful people who helped me, "said the woman, who is president of the organization. "When I returned to my country and saw the need, I told myself that it was time to share more. It was time to form an organization where larger companies collaborated too,” Castro said about the beginnings of Lazos de Ayuda. 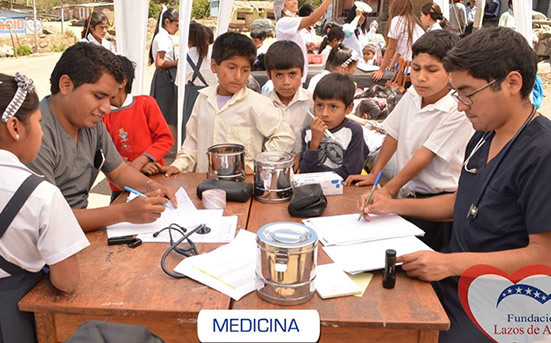 Today, the entity seeks to meet the educational, health and spiritual needs of the Peruvian community in Lambayeque. An aid that translates into bringing school materials to children, educational talks, sewing and tailoring workshops, hairdressing courses and medical visits to the most remote places of the area. The effort requires not only the support of volunteers who give their hands from Georgia through galas, events and donations, but also a team coordinated by Castro in Peru, where universities and doctors stand out. 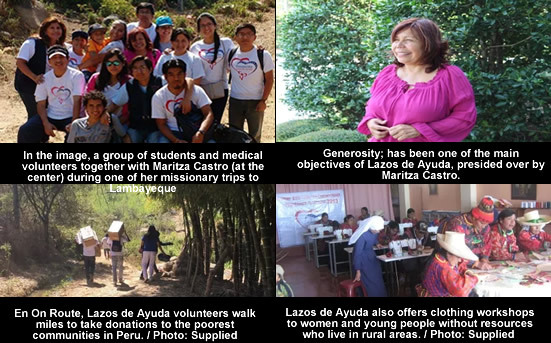 "Being part of Lazos de Ayuda has impregnated a deep footprint in my heart that guides me to help those most in need," added the psychologist and volunteer in Peru Fiorella I. Álamo. For the volunteer Diana Janeth Casusol, a young medical student at the National University Pedro Ruiz Gallo in Peru, the satisfaction is the same. "Thanks to Lazos de Ayuda Foundation, we can transmit a message of camaraderie, solidarity, mutual help, understanding, generosity, teamwork, and, above all, giving as much or as little that we have to our friends and brothers. Our spirit is enriched when we donate our time to talk with those children from the most remote and economically needy areas, but with their enthusiasm and courage, they also fill us with their innocent and sweet energy "
Lazos De Ayuda Foundation together with its doctors, young volunteer students from the Faculty of Human Medicine of Univ. 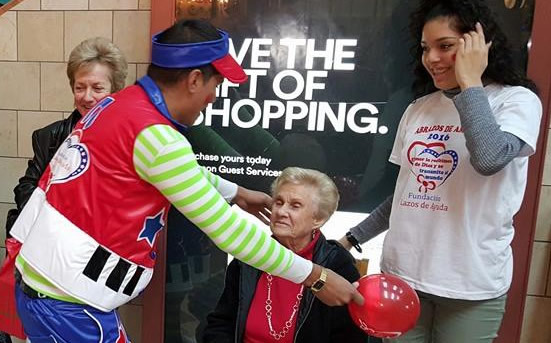 Pedro Ruiz Gallo, professional volunteers, and people of good heart made it possible to reach the goal with this health campaign serving more than 300 people, mostly children. Making a bond of love through the doctors visiting the village of Sauce. Lazos de Ayuda Foundation, coordinated with the chief doctor of the medical post of the willow farm Dr. Javier Torres Valencia. Triage, General Medicine, Fluorization, Pediatrics, Psychology, Vaccination services were included during the days 25, 26 and 27 of August. There were also talks about hand washing and the correct use of a toothbrush. The foundation donated brushes and toothpaste for each child. The most common diseases found were escabiosis, respiratory infections, acarosis, and malnutrition. The population of extreme poverty is scattered among the villages of Salas, Morrope Cañaris and Incahuasi. Javier Torres Valencia P.S El Sauce. TRANSPORTATION AND VIATATICS AND ALL THE EXPENSES OF THE CAMPAIGN WERE COVERED BY LAZOS DE AYUDA FOUNDATION THANKS TO THE 2016 GALA PERUANA EVENT AND TO OUR SPONSORS OF THE CITY OF ATLANTA, WHOSE LOGOS WERE DISPLAYED IN EACH EVENT CARRIED OUT. Once again, we thank God for uniting us in this bond of love and allowing us to continue working for the love of the neediest, who unites us. Because we always have something to give and a lot to learn. Lazos de Ayuda Foundation together with the student volunteers of human medicine from the Pedro Ruiz Gallo University of Lambayeque, this time fulfilling the objective of the 2016 school campaign, we visited 10 elementary, middle and High schools of the District of Salas of the Province of Lambayeque, Department of LAMBAYEQUE, rural areas of the North of PERU, in addition the young volunteers gave talks on hand washing and control of pediculosis. In the campaign we delivered 350 school supplies and backpacks, encouraging them to move forward guided by spiritual and humanitarian values. Which are so important for life. Our visit seeks to motivate them to move forward guided by spiritual and humanitarian values; love was lived in the embraces of each other. There were tears from a teacher when she told of her experience in a childhood without resources, which is how we could learn to teach and share. We thank God for giving us the opportunity to carry out this mission and thank you very much to all those who did their bit to achieve this goal 2016 CAMPAIGN SCHOOL. Thanks to the Consul General of Peru in Atlanta, Mr. Miguel Alemán Urteaga, to Pastor Nicolás Domínguez for his assistance and reflection through the word of God, to Blanquita Domínguez for bringing us the spirit of love for God and her support for the organization of the "8th Anniversary" event of the Lazos de Ayuda Foundation. Thanks to the teacher Christian Zamora from Chile, Johana López, Charles Mori, Mango's restaurant and Atlanta Spring Hall for their great collaboration in giving us the room for the event. To Mrs. Doris Fitzcararrald, to Orlando Fidel Silva for delighting us with the joy of the Peruvian Folklore. 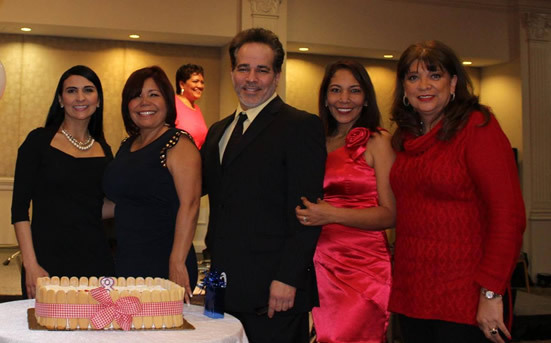 As well as all the volunteers and friends who attended with whom we could share the love and joy of the eighth anniversary of the Lazos de Ayuda Foundation. "HUGS & LOVE IN THE CITY OF CHICLAYO AND IN THE CITY OF ATLANTA"
"LOVE IS RECEIVED FROM GOD AND TRANSMITTED TO THE WORLD". Lazos de Ayuda Foundation on Valentines Day held the event "HUGS & LOVE - FREE HUGS" in the city of Chiclayo in Peru and the city of Atlanta-Georgia. All the love inspired by God our creator was offered by our volunteers to all the people that we could embrace with joy and peace.